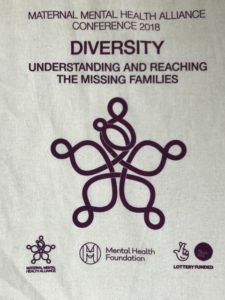 When I look back on the first talks I did from 2005 on my story of postnatal illness, the events were “generic” mental health or maternity ones. 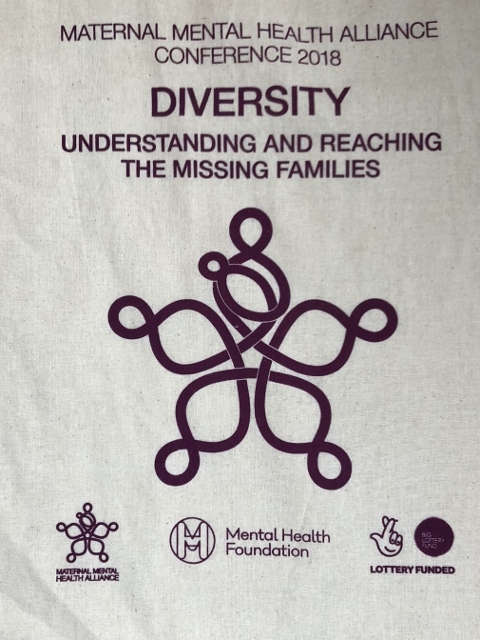 At the 2nd Maternal Mental Health Alliance (MMHA) Conference in London yesterday, it was incredible to have 300 people there solely on perinatal mental health. Determination – to continue to speak out about the very real need to keep on making early parenthood better for others. My expenses and attendance were made possible thanks to my role as a Maternal Mental Health Champion. I am part of a group of women who are prepared to speak at events, either independently or under the umbrella of the MMHA. You can read our stories on the website here. The top photo is of those of us who attended yesterday. I am honoured to be part of them. I do also need to shout out about my accommodation! One of my best friends from college, Margaret Gregg, told me that her daughter Emily, works in the university holidays for LSE. They use the university halls of residence as ‘hotels’ out of term time. I managed to get a very clean and comfortable room with breakfast for £36.70, a few minutes’ walk from Euston! I highly recommend them. Emily has also raised money for mental health charities in running events. One of the first people I saw yesterday was Dr Alain Gregoire. I have known him since 2006 when I was invited to be the opening speaker at the international Marce Society conference at Keele University. Back then there was so little being done for perinatal mental health. He was the main founder of the MMHA; this organisation has brought together so many services under one collective. Through this, funding was obtained, and a huge impact was subsequently made by the release of the map to show where services existed (or not) in the UK. The red areas have become a motivation to many to get them to turn green! Yesterday I was given my own mini pull-up stand to display on my travels – as seen on the top photo. Back to Alain, who has worked tirelessly over the years in this area. One of the highlights was seeing him speechless (for once!) 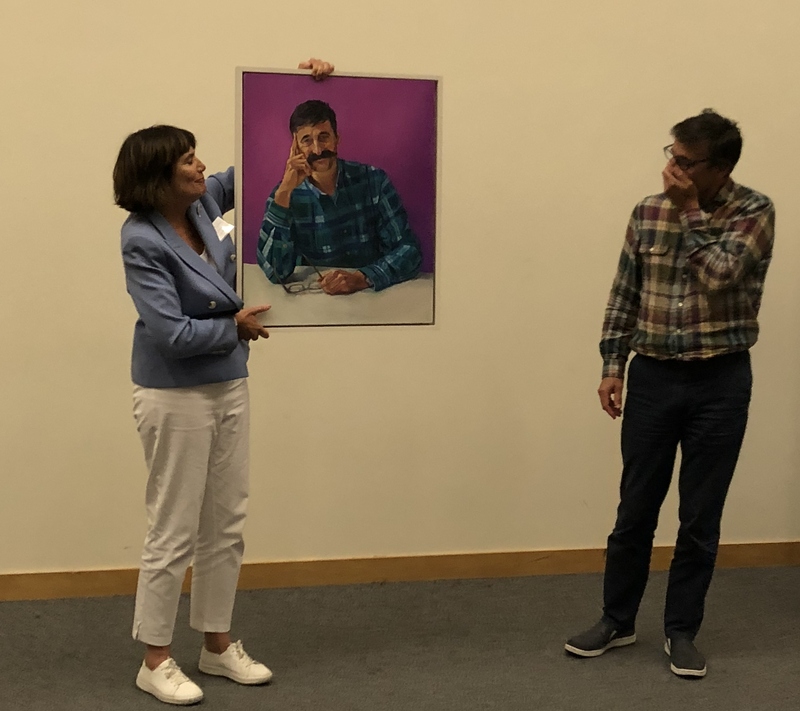 when he was presented, by vice-chair of the MMHA Clare Dolman, with a self-portrait painted by a former patient of his. Jenny was featured on the documentary he made with the BBC, ‘My baby, psychosis and me’. Now many of you will be aware that one of my rules in life is to look after myself so that I can look after others. Part of that is to tell myself to ‘stop’! So, as I have a long shift ahead today in my local shop I shall continue this tomorrow … I have lots to share with you! Tracy Plaice on ‘Eye’ have surgery tomorrow – farewell for a little while! Sandra on ‘Eye’ have surgery tomorrow – farewell for a little while! Sabine on ‘Eye’ have surgery tomorrow – farewell for a little while! Mike Booth on Putting my own oxygen mask on – why I had disappeared!